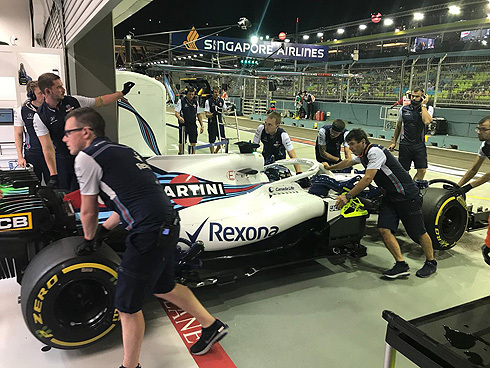 The second Friday practice session for the 2018 Singapore GP would see the Williams Martini team again struggle with their drivers finishing the session slowest. Lance Stroll ansd Sergey Sirotkin would finish in 19th and 20th after what was a fairly uneventful session. Seregy would have a minor moment early in the session while Lance would have an issue with his rear brake that would see him pit late in the session not returning. Based on the two Friday sessions the prospects for the rest of the weekend were looking very poor. With the start of the second Friday practice it would be Grosjean who would set a time with a 1m:44.748 but quickly others would go ahead with Bottas now quickest using the ultrasoft tyre, 1m:41.694 but Vettel would go ahead with a 1m:41.520. Both had used the ultrasoft tyre while Raikkonen would go quickest with a 1m:41.267. Vettel was second followed by Bottas, Hulkenberg, Sainz and Leclerc in sixth. 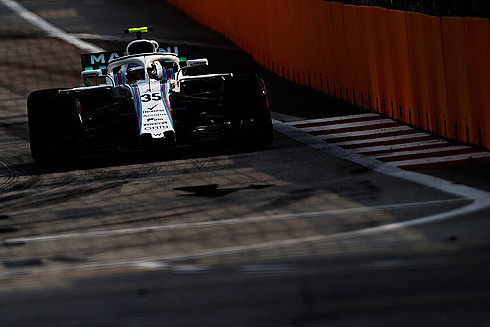 After their first runs the Williams drivers were in 15th and 16th while at the front Hamilton would go quickest only to see Vettel move ahead with a 1m:40.972. Verstappen was now third followed by Raikkonen and Bottas. Ricciardo would move into third also using the ultrasoft tyre with the Williams drivers now 19th and 20th. Raikkonen would go quickest with a 1m:40.510 now followed by Ricciardo and Vettel. Verstappen and Vettel would move ahead of Ricciardo to be second and third. With over twenty minutes of the session completed the Williams drivers were in 17th and 20th. Raikkonen was leading from Verstappen, Vettel, Ricciardo, Hamilton, Bottas, Perez, Alonso, Hulkenberg and Ericsson tenth. Twenty five minutes completed and there were just a handful of drivers running. Ricciardo would move up to third with the Williams drivers now 18th and 20th. Drivers started to make runs on the hypersoft tyre with Hulkenberg and Bottas both running on this tyre. Hulkenberg would move into fifth while Bottas would set a 1m:39.368 to be quickest. More drivers were coming out running on the hypersoft tyre as Sainz moved into second and then Hamilton would set a 1m:38.710 to be quickest using the hypersoft tyre. Raikkonen would go quickest with a 1m:38.699 followed by Hamilton and Bottas. Ricciardo would improve to be fourth followed by Sainz, Grosjean and Alonso. Verstappen would improve to be fourth ahead of his team-mate. Vettel would start his hypersoft tyre run but would brush the wall seeing him take to the pits with damage to his car currently ninth. Verstappen was now third ahead of his team-mate Ricciardo. Bottas was now fifth ahead of Sainz and Grosjean. After the hypersoft tyre runs the Williams drivers were 19th and 20th. 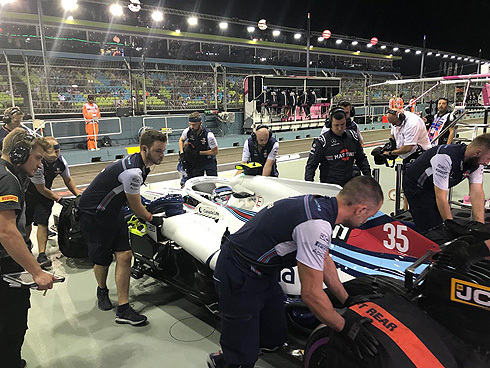 The final part of the session would see the teams work through race simulations with drivers using the soft, ultrasoft tyre and hypersoft tyre in their runs. Both Williams drivers were on longer runs on the hypersoft tyre but Lance would pit with a brake issue. Ten minutes remaining and drivers were changing tyres moving from the hypersoft tyre to the ultrasoft and even soft tyre. Vettel would take no further part in the session due to damage to his car. The session would come to an end with Raikkonen remaining quickest from Hamilton, Verstappen, Ricciardo, Bottas, Sainz, Grosjean, Alonso, Vettel, and Hulkenberg. The Williams drivers would remain slowest in a repeat of their disappointing performances from the earlier session. The prospects of it improving over the rest of the weekend were not looking even remotely promising. Lance would come out running the soft tyre for the first time and would set a 1m:44.530 to currently be 13th. He would drop to 19th becoming 20th as his team-mate moved ahead. But Lance continued to run on the soft tyre. Lance would also come into his pit after an eight lap run. Lance would also come out for a hypersoft tyre run with fifty five minutes remaining. Lance would set a 1m:42.141 to now be 16th. He would drop to 19th with under forty five minutes remaining. Replays would show that Lance's rear brake was actually on fire. His engineer would come on the radio saying "We need to cool the brakes." and would tell him to pit. He would remain in his pit as the session completed. Sergey would be the first out for Williams in the second session using again the ultrasoft tyre. Sergey would set a 1m:46.649 to currently be ninth dropping to 11th. he had a small moment at Turn eight but was able to continue. This would become 14th one place behind his team-mate. He would drop to 20th as he continued to lap on the ultrasoft tyre. But Sergey was able to improve with a 1m:43.925 to be 17th. Sergey would pit after an eight lap run. He would drop to 18th and with just under an hour remaining he would return using the hypersoft tyre and would set a 1m:42.414 to be 15th. He would drop to 19th as others did their hypersoft tyre runs. Sergey would set a 1m:42.181 to be 19th dropping to 20th. Sergey would continue to lap the circuit on a longer run with twenty minutes remaining. He would pit changing to the ultrasoft tyre. With the end of the session he would complete twelve laps on the end of the session.